This website was launched in 2008 in order to help promote the study of the history, philosophy and techniques of Hellenistic astrology. It maintained by Chris Brennan, who is a practicing astrologer and researcher from Denver, Colorado, USA. All entries were written by him unless stated otherwise. Hellenistic astrology is a tradition of horoscopic astrology that was practiced primarily in the areas surrounding the Mediterranean from approximately the 1st century BCE until the 7th century CE. The tradition represents a synthesis of the earlier Mesopotamian and Egyptian astrological traditions, and this synthesis has been infused with a number of Greek scientific and philosophical concepts that were prevalent in the late Hellenistic period. Technically the greater part of the history and practice of what we call “Hellenistic astrology” took place after the Hellenistic period proper, during the Roman imperial period. However, it is still called Hellenistic astrology because the system originated during the later part of the Hellenistic period, and it continued to represent many of the scientific, philosophical and cosmological speculations that characterized the culture of that period. For a chronological overview please see our timeline of ancient astrologers. 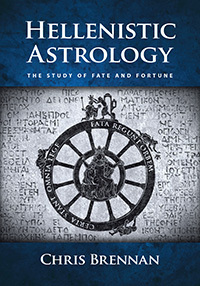 Our new book on Hellenistic astrology is out! Did Ptolemy Use Whole Sign Houses?